The Himalayan region has received one of the heaviest snowfalls in many years. 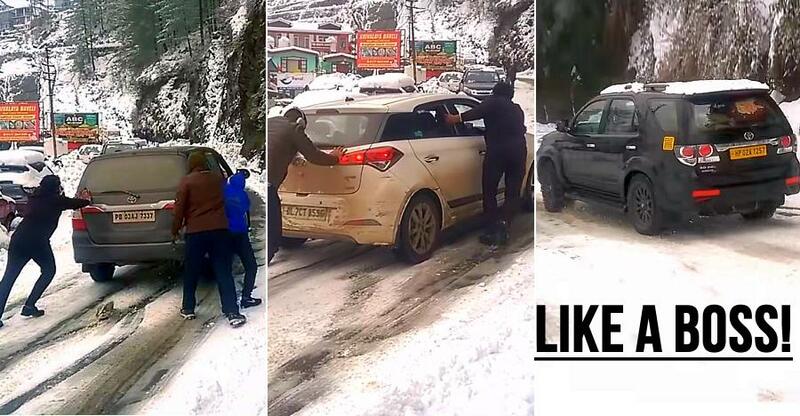 This video is from the Shimla region, which also received heavy snowfall and the roads were covered with a thick layer of snow. This video shows how the 2WD vehicles struggled to get up the snow-topped incline of the region. The video starts with showing a struggling Toyota Innova trying to climb the incline. But due to the slippery surface, it fails to climb the slope at all. The Toyota Innova Crysta is a Rear Wheel Drive vehicle, and even after people trying to push the car, it kept on slipping and could not go up. Later a Hyundai Elite i20 tries to climb on the same incline, but the result turned out to be the same. The Hyundai Elite i20 kept on the going on its side irrespective of the direction of the front tyres of the vehicle. The video also shows a Hyundai Xcent, which came in at speed and tried using the momentum to climb the incline failed too. We can also see a local number registered Maruti Suzuki Alto with aftermarket wide tyres. The Alto worked for numerous times and even called people to help it push, but it just could not find enough traction to climb up. Later the Alto gave up and parked on the side too. It later shows on the video that an older-generation Maruti Suzuki Dzire trying to climb up in the snow-topped tarmac but slipping sideways. A Toyota Fortuner comes from behind and effortlessly overtakes the Maruti Suzuki Dzire, which shows the difference between the 4X4 and 4X2 vehicles in the difficult and challenging situations. There is a Honda CR-V coming down in the middle of the video, which faces no such problem while coming down on the slope while a commercial vehicle can be seen braking hard while coming down and slipping down the surface. We can also see a Volkswagen Ameo with snow chains installed on the front wheels. It also braked successfully while coming down the slope. While it is not very difficult to drive on fresh snow as it is very soft and grips the tyres well, the old snow becomes hard and slippery making it extremely difficult for the vehicles to grip on it. Apart from the vehicle’s capability, the tyres play a major role in such situations. While the vehicles with snow chains are very successful in breaking the snow and finding the proper grip of the vehicle, good tyres with big grooves are also somewhat successful in finding grip on such slippery surfaces. The Toyota Fortuner we saw in the video did not slip for on a single corner, and it was going quite fast too. Why? Because the Toyota Fortuner 4X4 is a full-time four-wheel drive system and there are snow chains on the alternate wheels of the Fortuner. The video shows that the front left tyre and the rear right tyres of the Toyota Fortuner get snow chains that further increases its capability on such surfaces. Such small things can prove to do wonders on the snowy surface as we have seen in the video. It is always advisable to use snow chains on all the tyres during the snow drives to avoid slipping of the vehicle. Also, driving at slow speeds, using the torque helps the vehicle in such tricky situations. We would like to add that adding snow chains on alternate wheels is a way to make things work but one should always use snow chains on all the four wheels. That helps in maintaining equal traction in all the four wheels and reduces the chances of vehicle spinning under acceleration or hard braking.